The summer glut of tomatoes is here. Take advantage and roast some to bake into a summery quiche. This is a deluxe quiche, one that requires time and a mindset that enjoys leisurely cooking. 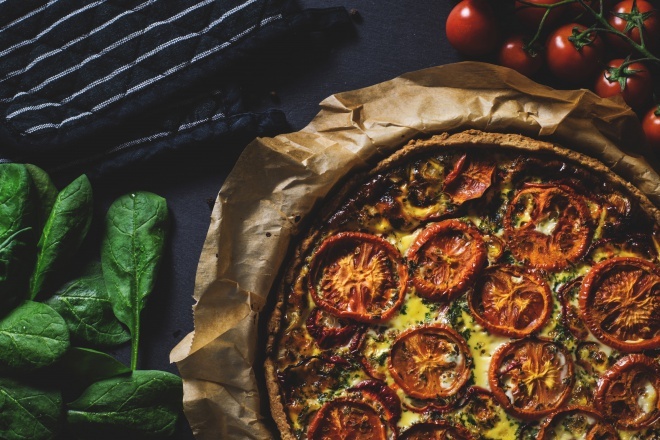 Roasting the tomatoes and peppers brings out their natural tart/sweetness, while spinach and caramelized onions contribute an earthy note. The quiche makes a lovely summer dinner, and leftovers, if any, make a good breakfast. Make the crust ahead of time, as it needs to chill at least 15 minutes before blind-baking it. You can always resort to pie crust from the supermarket… but home-made is easy, and so much tastier. Serve the quiche warm or at room temperature, with a glass of chilled white or rosé wine. Or beer! Enjoy! Preheat the oven to 230° C – 450° F .
Place the tomato and pepper slices on the lined baking tray. Dribble them with about a tablespoon of the olive oil. Salt the tomatoes and peppers lightly. Roast the tomatoes and peppers 12 minutes, or until wilted with blackened edges. Suggestion: Roast extra tomatoes and peppers. Fill omelets or top pasta with them, or chuck some into salad. Or just eat them out of hand as soon as you’ve taken them out of the oven. In the meantime, pour the remaining olive oil into a wok or saute pan and heat it over medium heat. Fry the sliced onion until it turns golden-brown. Stir the spinach leaves in. Continue to cook and stir until the spinach is wilted. Remove the tomatoes and peppers from the oven. Reduce the oven temperature to 160°C/320° F.
Roll the chilled pastry out on a floured surface to make a circle that will generously line a 18 cm./7-inch quiche or tart pan. Line the pan with the pastry. There should be extra pastry hanging over the edge of the pan. Place baking parchment over the pastry, covering the bottom and the sides. Cover the bottom with dried beans. Bake the crust 40 minutes. Lift the beans and paper off the crust and bake the crust another 10 minutes. You can store the cooled beans in a jar and use them over and over again. Drain the onion and spinach. Season them with salt and pepper to taste. Cover the crust with the onion and spinach. Strip the leaves off 1 thyme or basil sprig and scatter them on top. Place the peppers and tomatoes over the onion and spinach. Scatter the diced cheese over everything. Blend the egg and the cream. Stir in a little salt and pepper. Pour it over the vegetables in the crust. Strip the leaves off the second thyme or basil sprig and scatter it over all. Bake the quiche 30 minutes. Check to see if the filling is firm and golden; if not, bake a further 10 minutes. Cool the quiche for 15 minutes. Break the excess pastry off the edges and serve. Place the flour and butter in the food processor and whizz until you the mix looks like breadcrumbs. Alternately, rub the butter into the flour with your fingers. Beat in the salt. Add 2-3 tbsp water, one tablespoon at a time, to obtain a firm dough. Knead it briefly on a floured surface. Wrap and chill while preparing the filling.